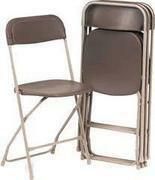 We offer black folding chair rentals for any event. Also check out our Table and Chair rental Packages. Note: If you are only ordering table and chairs there is a $125.00 min order, for delivery. We do offer min order of 65.00 for customer pick up.